My biggest swim yet this Friday! 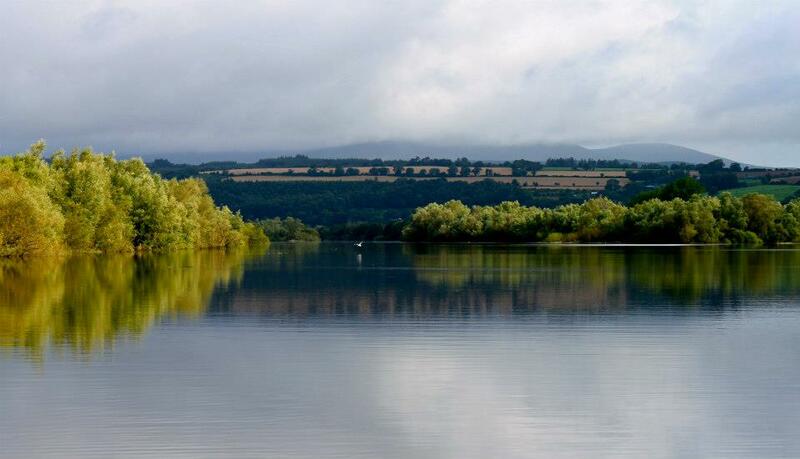 When I start the swim at 7:00 am from Fermoy Rowing Club, my crew will consist of three trusty kayakers: Donal Buckley, Mona Sexton and Maura Murphy. 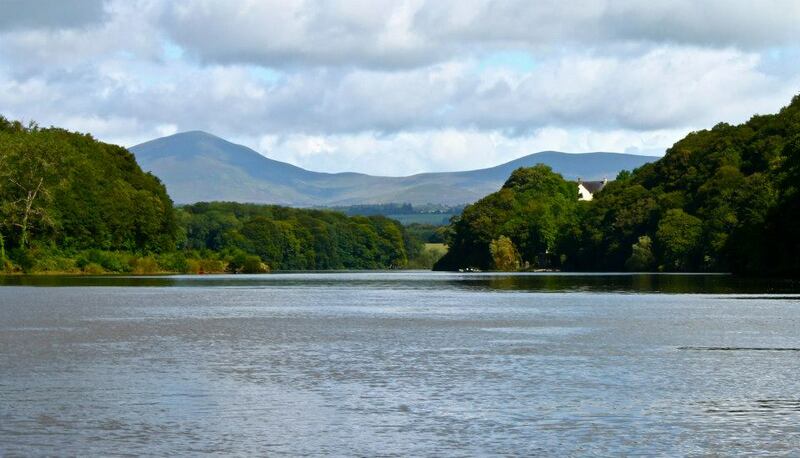 Having crossed weirs at Fermoy, Clondulane and Lismore and the many rapids in between, we’ll reach tidal waters before the town of Cappoquin. There, we will meet the support boat, a 28-foot half-decker called “Maeve Óg”. The captain will be Tony Gallagher of Blackwater Cruises and his first mate will be his little terrier, Pharaoh! At this point, Maura will be bidding us farewell, Donal will be transferring to the boat and Mona will continue kayaking by my side right to the finish. Already on the boat will be Róisín Lewis and Paul Noonan, both experienced swimmers and good friends of mine. By the way, the total distance from the start in Fermoy to the finish in Youghal is 60.0 km exactly. The total swim time for the three swims comes in at just under 10 hours! I can only swim at 4.0 km per hour, so that gives you an idea of the average assistance that I got from the River across the three swims. Google Earth image of the completed Blackwater Project 2012. 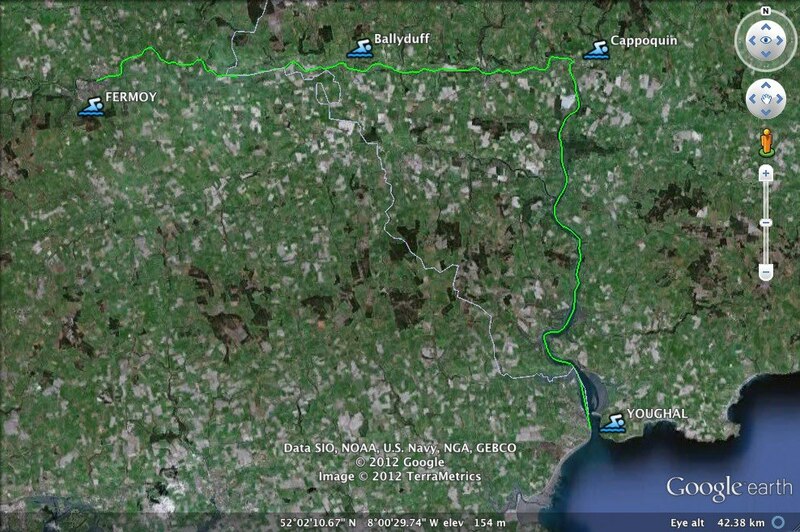 The green line is my swimming route and the white line is the Cork-Waterford county boundary. Where to from here? 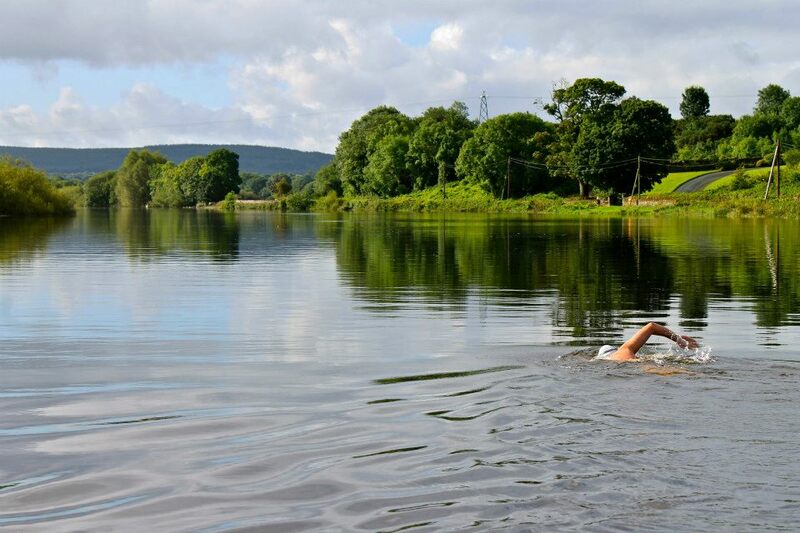 Will there be more long swims on the Blackwater? I have no plans set in stone yet. 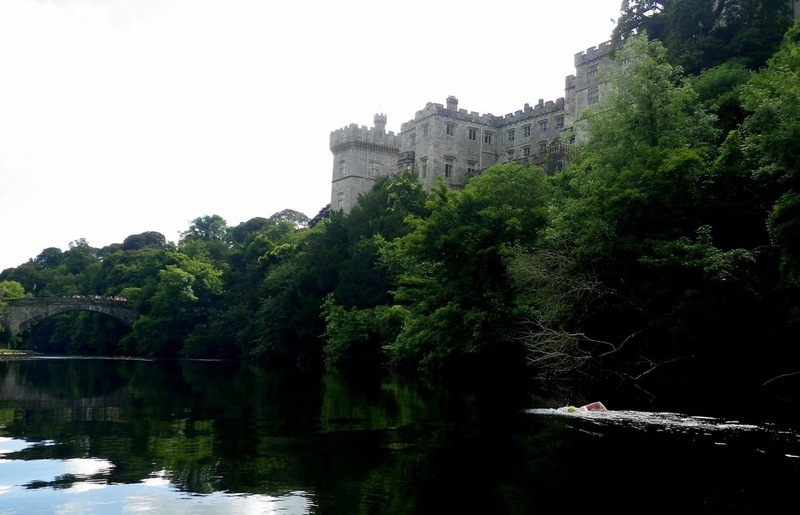 I may have a go at another long swim further upriver – there is the possibility of swimming the 30 km from Mallow to Fermoy – or move onto one of the tributaries – the River Bride would be most practical. As well as this, I may organise a race from Cappoquin to Youghal – now that would be interesting – or continue this project along the East Cork coast to Ballycotton where I used to swim with my grandfather on Sunday afternoons during the summer holidays – it would be really cool to have covered all of the water between our swimming spots in Fermoy and in Ballycotton! On the planned day, we all met up by the only usable slipway in Youghal. Donal expressed some concern about the final part of the swim due to an ongoing E. coli outbreak on many of Cork’s beaches, including Front Strand in Youghal. After some discussion, we agreed that Donal would make the final decision on whether or not to call an end to the swim once we’d reached Youghal Bridge. Luckily, it never came to that as news came through that tests carried out on water samples taken the previous day showed the water to be of suitable quality for swimming. 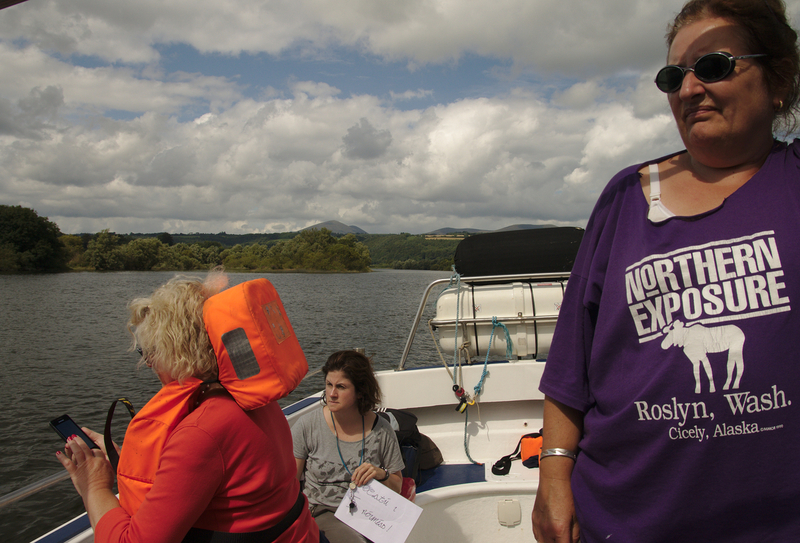 We then launched the RIB and loaded it up with everything that we would need during the swim. 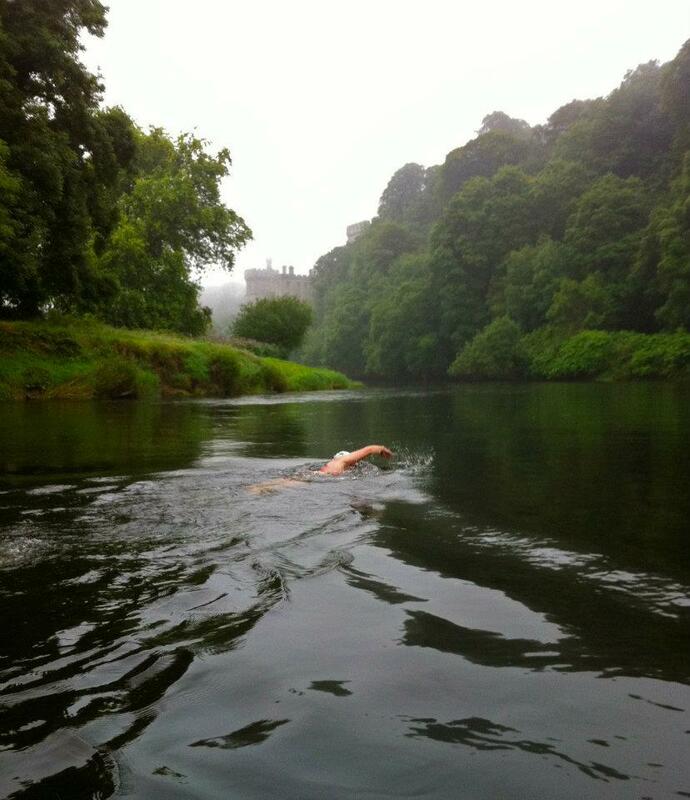 With that done, we motored upriver towards Cappoquin to start the swim. I can tell you that the boat trip up the Blackwater from Youghal to Cappoquin is infinitely more enjoyable than motoring from Dover Marina to Shakespeare Beach or Samphire Hoe for the start of an English Channel swim! 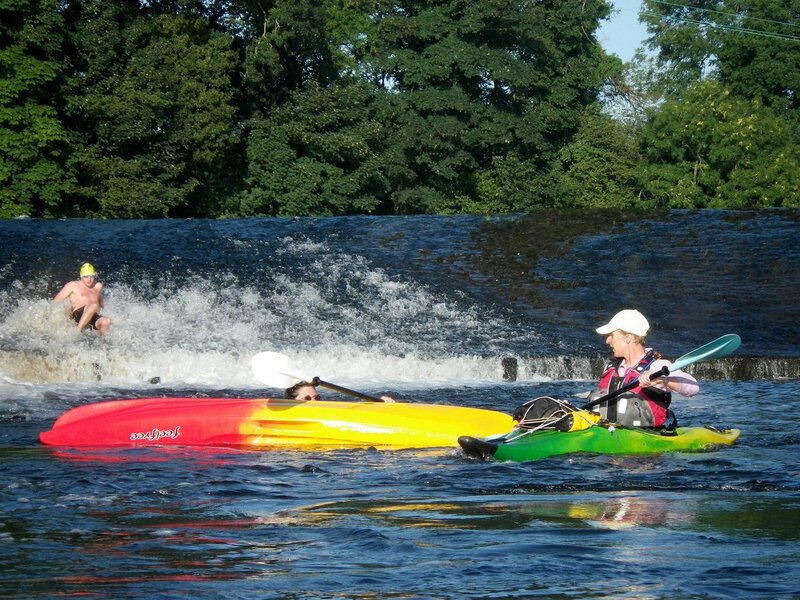 After our scenic tour up the River, we arrived at Cappoquin Rowing Club where we pulled up at the pontoon to refuel. While Billy and Tom were refueling the boat, I was getting changed and greased up and Donal was checking the water temperature – he measured 15.6ºC, not bad at all! With all that stuff out of the way, we all got back on board and drifted down to the slipway at Port na h-Abhann, this was where I finished my swim from Ballyduff… Once we were near the slipway, I jumped over the side and swam cautiously onto the slip, for I was conscious of the sunken punt that was just under the surface! Feet on dry land, I fixed me goggles, turned around and gave the crew the signal that I was ready. Donal called the start, 09:49, and I walked back into the water and started swimming, still careful to avoid the “wreck” below me! The next major landmark was the confluence of the Rivers Blackwater and Bride. The Bride is arguably the Blackwater’s most important tributary. When the Blackwater was navigable for merchant ships, many docked at Camphire Quay on the Bride to offload and collect goods. Not far below this point we come to one of the finest houses on this stretch of river: Strancally Castle. 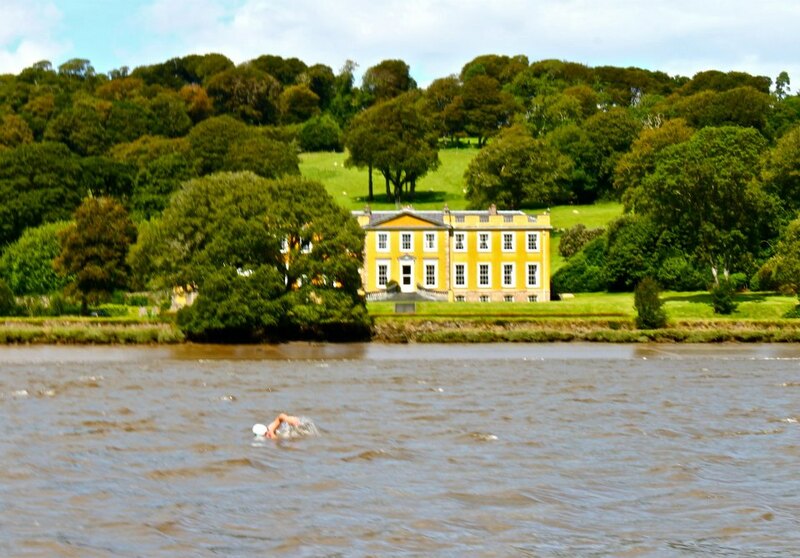 This 19thCentury castle come modern family home, with its extensive grounds and jetty leading to a luxury pleasure boat, might seem out of place in rural Ireland, but the setting is idyllic if the weather is cooperating! While the water was glassily calm by the contemporary Strancally Castle, by the time we had reach the ruin of the original, there was an incessant 0.5 m chop blowing at us which made the going tough for a while. Strangely, conditions calmed where the River got really wide near Clashmore. Then, as we turned west towards Ballynatray, it got quite rough again. 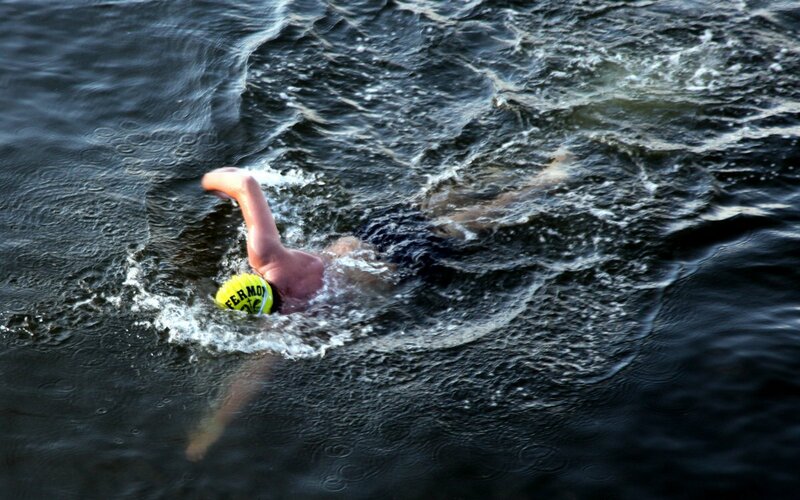 It was a great feeling to swim under Youghal Bridge, after all the years of driving over the Bridge and straining to see what was around the next bend in the River, I had finally seen every bit of the River’s course between home and Youghal. 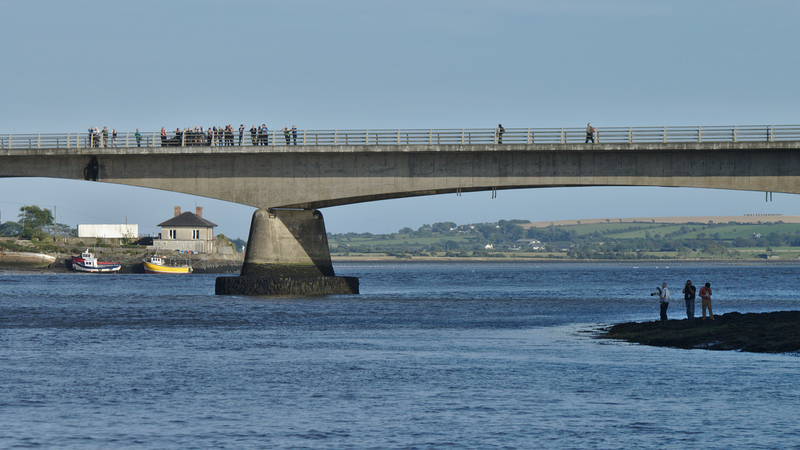 All along, I had mentally prepared myself for a long 2 km slog across Youghal Bay once under the Bridge – 2 km can seem long at the end of a big swim, plus none of us knew what effect the currents might have. In any case, I was feeling good and was ready for the final effort. As it turned out, we still had great assistance from the current and from the tide. However, a strong southerly wind was blowing directly against us and the strong flow of water, causing increasingly severe chop as we neared the mouth of the Bay. Before long, we were passing the town of Youghal and the slipway where we had launched from earlier. Once we had passed Ferry Point on our left, we could say that we were in the sea. The lighthouse was just ahead on the right so it was time to turn in to the right and swim into shore. I cautiously made my in to the muddy-sandy beach just south of the Walter Raleigh Pier. I eventually got my feet on some not-so-silty ground and waded, knee-deep in rotting seaweed, onto the beach. 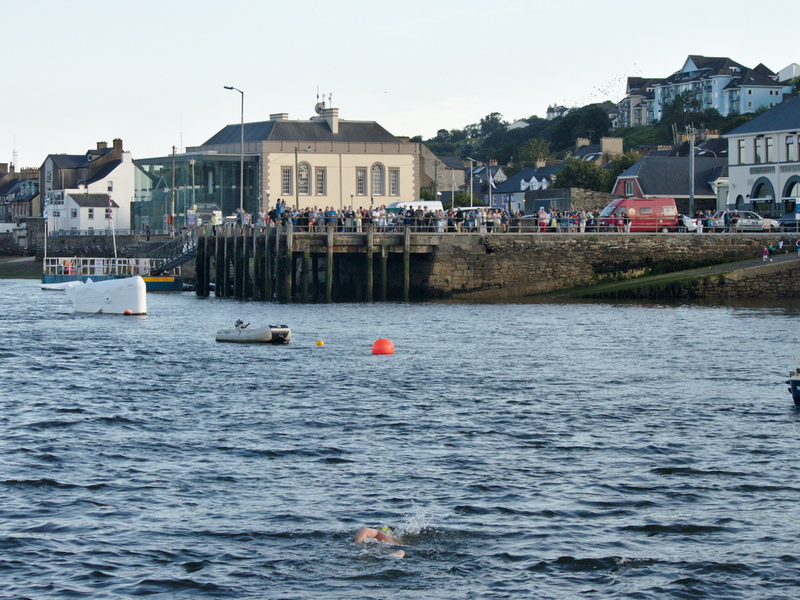 Again, Donal called the finish, 14:17, giving a total swim time of 4 hours 27 minutes 34 seconds. Given that this swim is technically the same distance as the Zürichsee-Schwimmen, I think that it’s fair to say that the River did a fair bit of the work! After enjoying my moment on the beach, I swam back to the boat and exited the water in the usual, undignified fashion. Back at the slipway, we got the boat back on the trailer and got soup and sandwiches in the Quays Bar. All were in agreement that the day was a great success and that everyone thoroughly themselves! 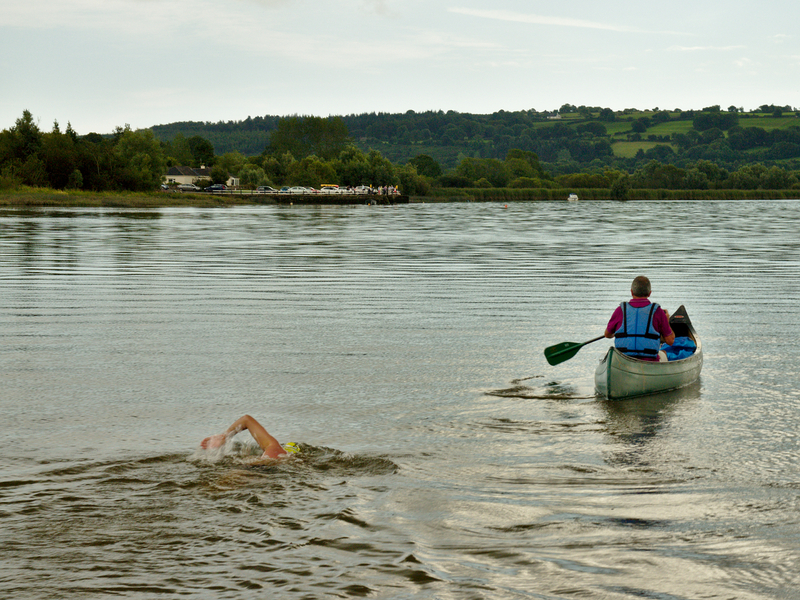 It’s always welcome news at the end of a big swim that your crew enjoyed themselves too. After my Fermoy to Ballyduff swim, it was off to Valentia Island, Co. Kerry for the annual Beginish Island Swim. What was a great weekend came to a pretty sobering end with the shocking news our friend, Páraic Casey, died tragically during his English Channel solo attempt. 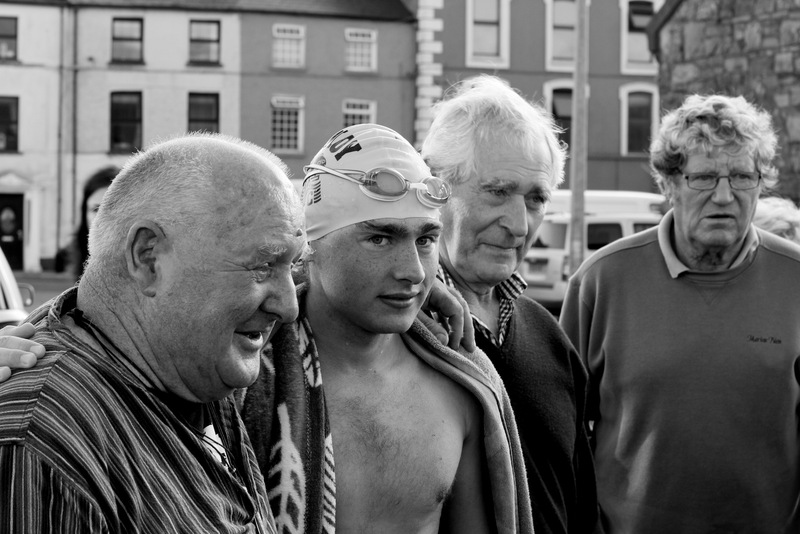 Páraic was a great friend to us all in the open water community and his death came as a great shock, not least to his wife Riana and to the other swimmers who had trained with Páraic for the last year. 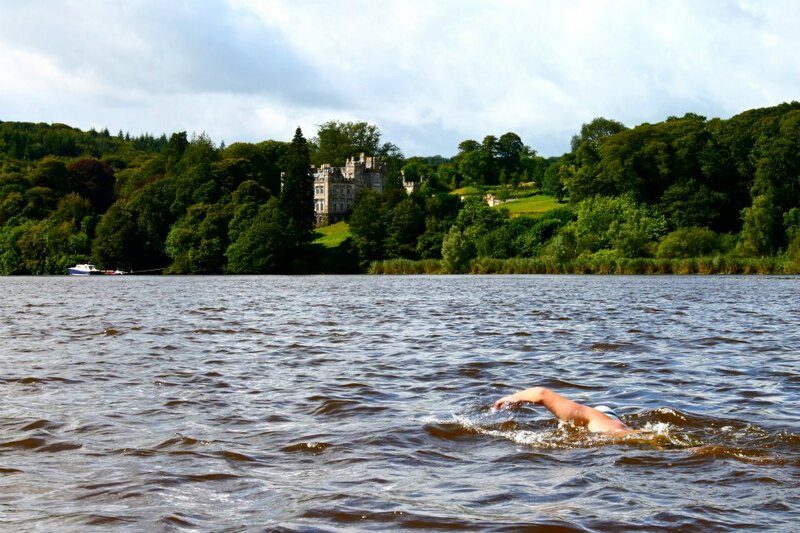 Maeve and I decided, after a while, that it was probably a good idea to go ahead with the Ballyduff to Cappoquin swim as planned – a decent immersion is, I think, a great help in absorbing such news. Anyway, Maeve and I met up in Fermoy at about 05:30 and set off for Cappoquin in separate cars. 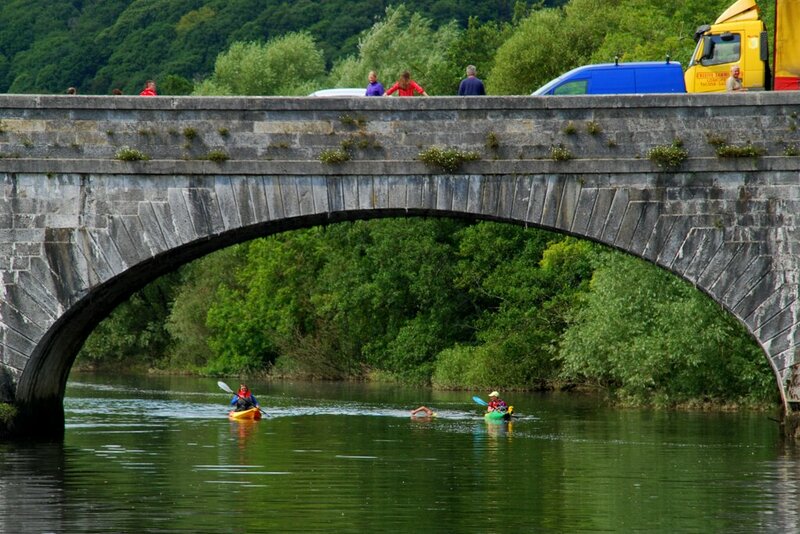 Once we parked up by the slipway in Cappoquin, I got changed into my swimming gear and Maeve got into her kayaking gear, leaving anything that we would need at the finish in my car. Then we both headed back to Ballyduff in Maeve’s car. When we arrived in Ballyduff, all that was left to be done was to get the kayak on the water and to secure the SPOT Tracker to it. With that done, I handed Maeve my mobile phone, from which she would be sending updates to my Twitter account using the #Blackwater2012 hashtag. 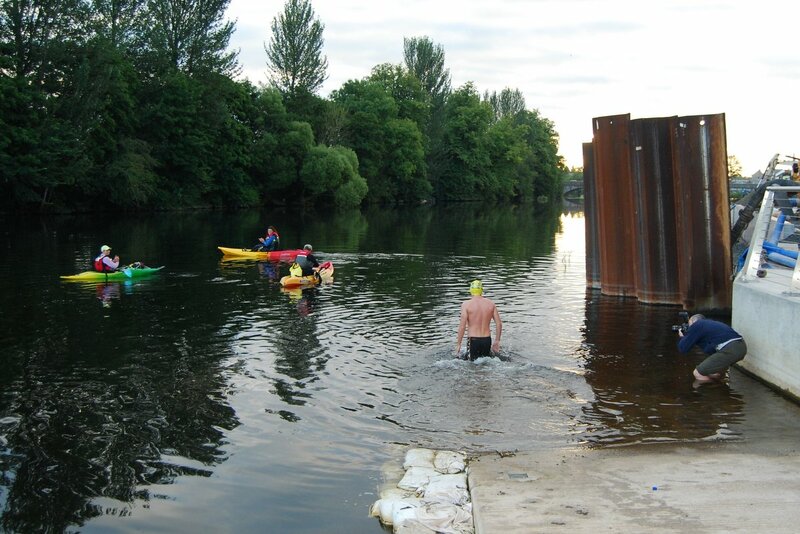 The swim finally got underway at 07:29, at the same spot where I finished my Fermoy to Ballyduff swim the Thursday previous. 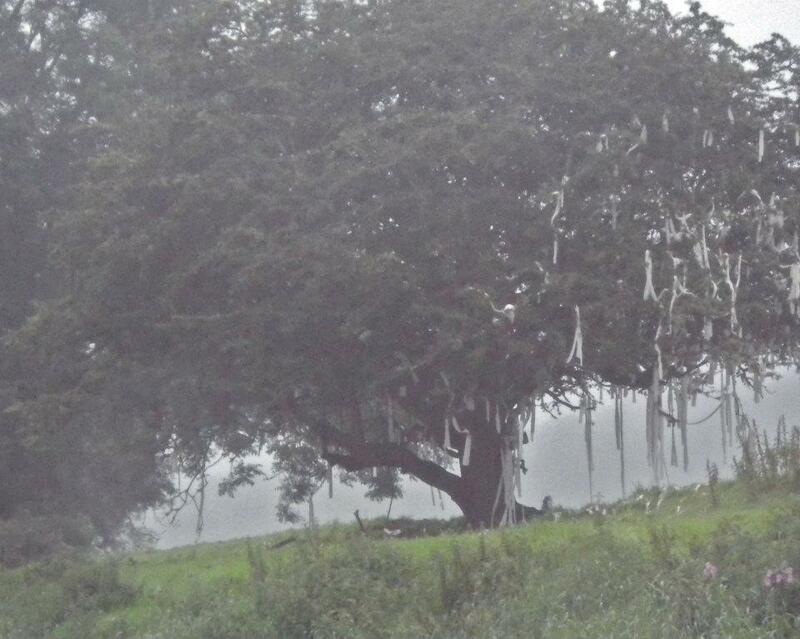 This tree was a very strange sight. Can anyone shed any light on what might be going on here? Although the water was a pleasant 15ºC, it was a cool and misty morning. The atmosphere was almost eerie as we progressed. The only sounds were the River and the birds. 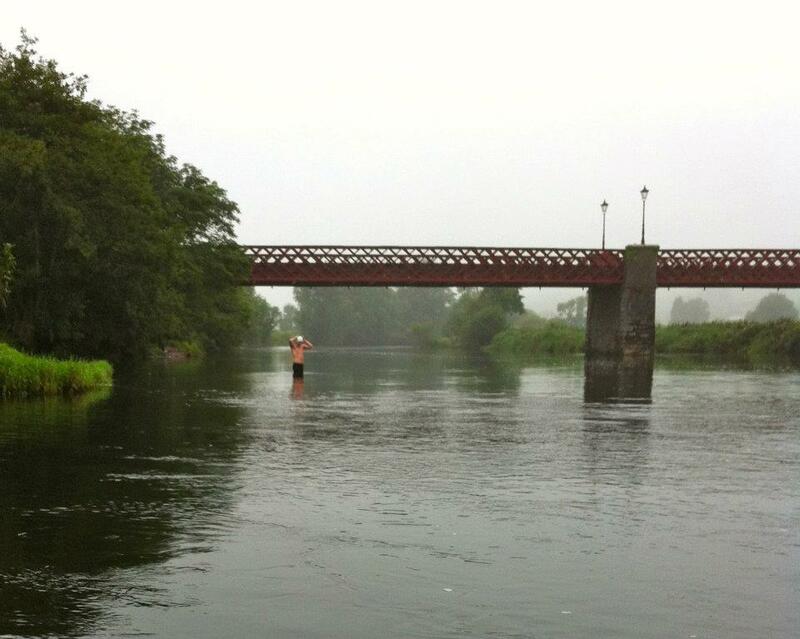 I must admit to being a little apprehensive about this swim as I knew little about the first 10 km after Ballyduff. It turns out that there are a good few rapids on this stretch, especially on the Glenmore beat just below Glencairn Abbey. There needs to have been some recent rain before you can take these on! After the rapids at the Fortwilliam Estate, there is a stretch of slightly deeper water, which makes for easier swimming. 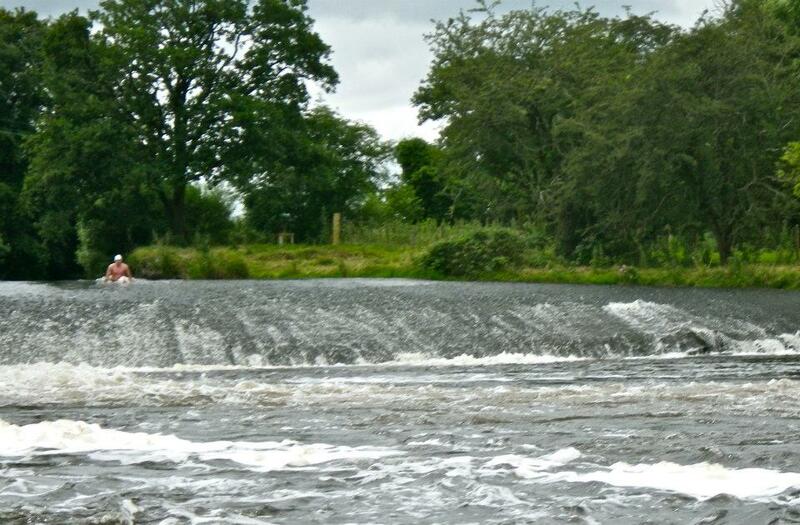 At the end of this stretch of deeper water are the beautiful Ballyin Gardens and a small salmon weir, Lismore Weir. 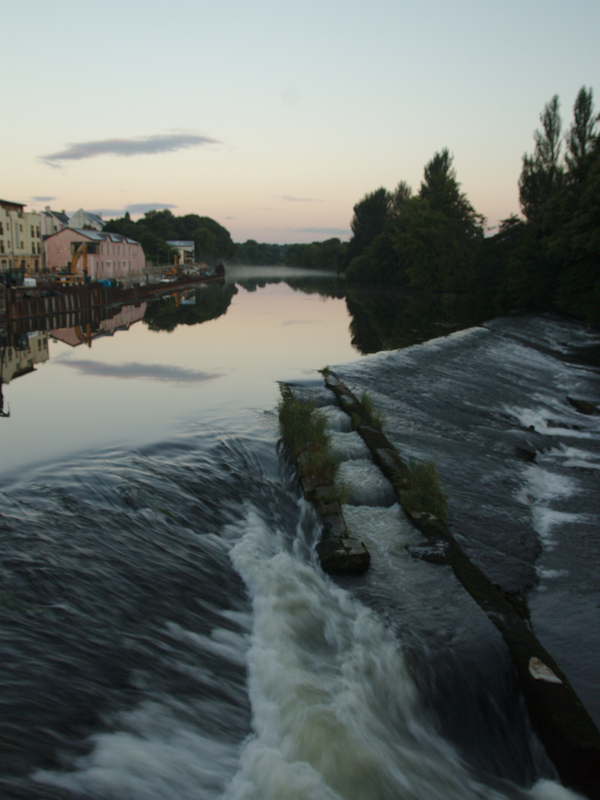 This isn’t a large weir like those in Fermoy and Clondulane, it’s less than 1 m high and has gap in one section, called the King’s Gap, through which most of the River’s flow is directed. When we came to this point, Maeve shot over in the kayak to test that it was safe. She gave me the all clear to swim through, rather than to walk around it. I swam straight through the gap, which was an exhilarating experience even if I did feel a bit like a dead goldfish being flushed down the toilet! Just after shooting Lismore Weir, coming around the bend to get our first view of the Castle. After this weir, the current whisked us quickly around a bend in the River and we got our first view of the magnificent Lismore Castle. This castle, which is over 800 years old, has been home to Sir Walter Raleigh, Richard Boyle, 1st Earl of Cork, and his more famous son Robert Boyle, one of the founders of modern chemistry. It is currently the second home of Peregrine Cavendish, 12th Duke of Devonshire. The town of Lismore is one of Ireland’s most picturesque towns, but I was delighted to have reached it for another reason, i.e. 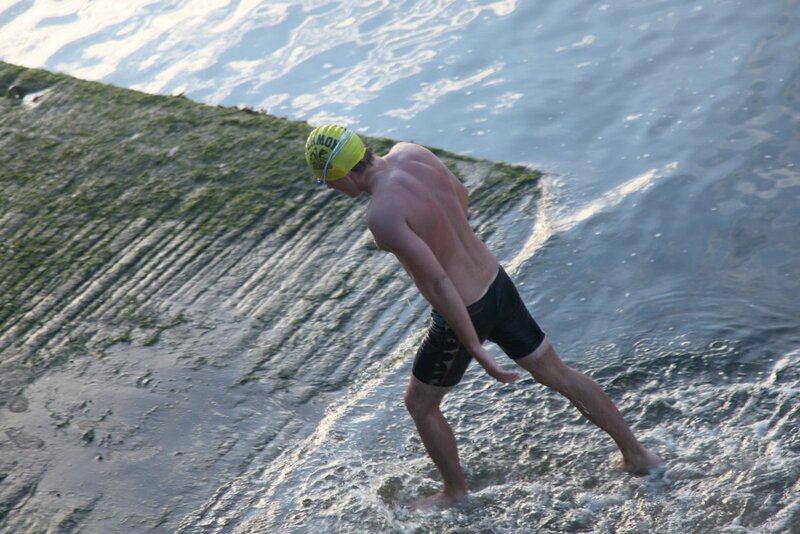 it meant that I was past the half-way point in the swim! Just after the bridge in Lismore, the Blackwater is joined by the River Owenashad, bringing cold, peat-stained water from the nearby Knockmealdown Mountains. The River becomes wide and shallow at this point, known as the Ballyrafter Flats. 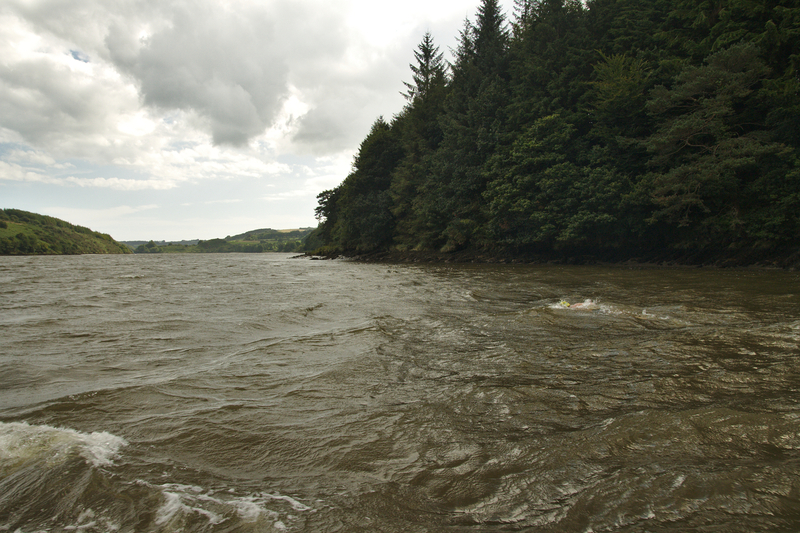 Exactly 10.0 km from the start of the swim in Ballyduff, we come to another set of islands with some very turbulent water. At the bottom of these rapids, the River becomes much deeper and the current almost stops – still over 30 km from the mouth of the River, we had reached sea level! 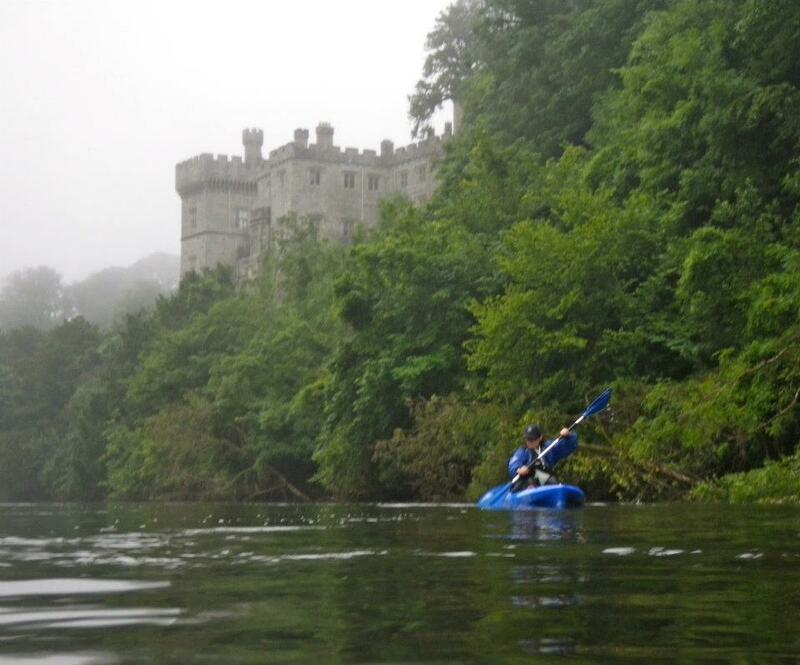 Here’s the trusty paddler, Maeve, with Lismore Castle in the background. This last stretch did seem to drag on a bit in comparison to running the rapids in the earlier part of the swim, but at least we got some nice views and met my grandfather who was watching from a lay-by where the River passes next to the road. 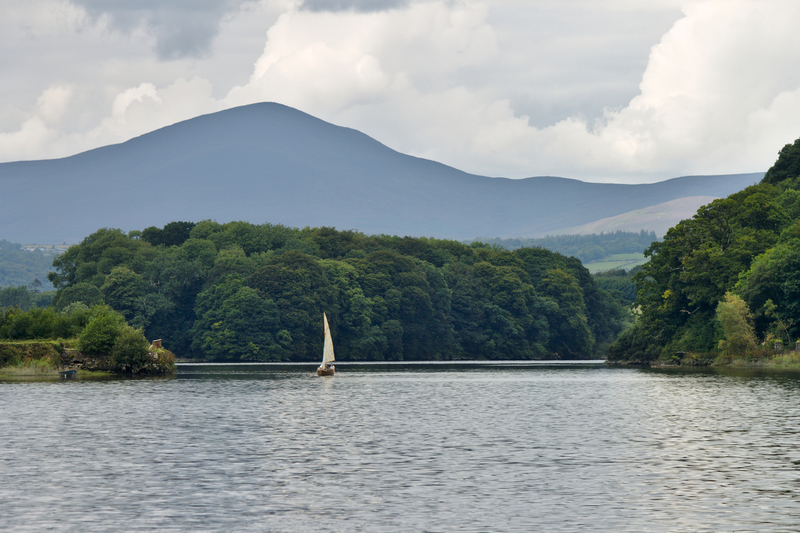 After a few words with him, we were on the final straight into Cappoquin – we could see Avonmore Bridge about 1 km away and the slipway was just on the other side of it. 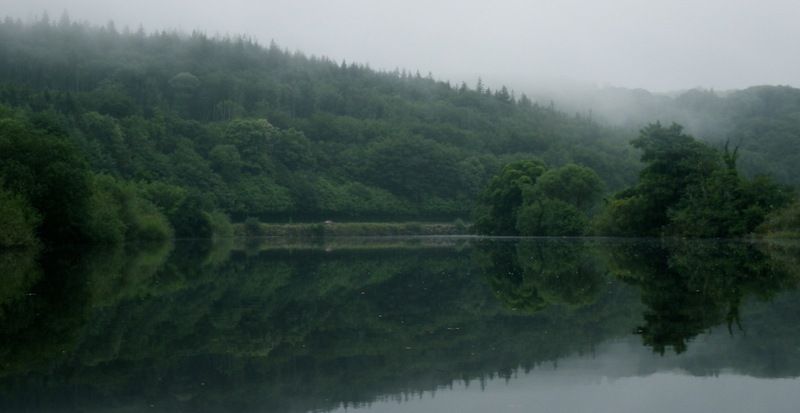 Mist on the Knockmealdowns nearing the end of the swim, about 3 km from Cappoquin. I reached the slipway at Port na h-Abhann, Cappoquin at 10:16, a modest time of 2 hours 46 minutes 24 seconds after first hitting the water in Ballyduff. Lo and behold, who should be there to meet us only my grandfather again. He told us that we had better hurry up getting the kayak up on the rook of the car and getting dressed because he had our breakfast ordered in Barron’s Bakery & Coffee House up in the town! After a very nice gluten-free breakfast there, we headed back to Ballyduff and transferred the kayak from my car to Maeve’s before heading home, content with having covered yet another stretch of virgin water for swimmers. Looking back at Avonmore Bridge from the slipway in Cappoquin.